What's the best way to eat really fresh tofu? My favorite every time is hiyayakko (cold tofu), but agedashi-dofu (deep fried tofu with dashi sauce) is a close second. 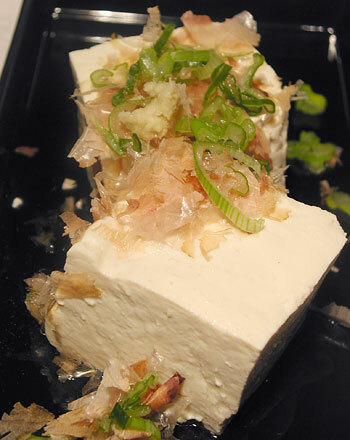 Hiyayakko is plain chilled tofu with a little garnish on top. You can add any number of garnishes, but my favorite is simply finely chopped green onion, grated fresh ginger, and bonito flakes, with a little sprinkle of soy sauce. Don't add too much soy sauce or it will mask the delicate flavor of the tofu. In the summer months I could eat this every day. At least half of my square of home made tofu gets eaten as hiyayakko every time. In the summer, some finely julienned shiso leaves make a nice addition too, as are toasted sesame seeds, red chili powder, and so on. Think of what you might like to put on top and go for it! 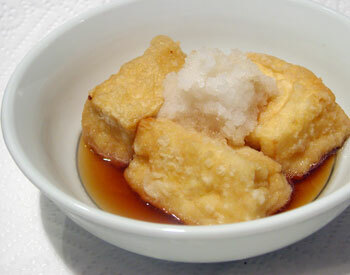 Agedashi-dofu is deep fried tofu with a simple dashi-stock based sauce. It's not the same as aburaage (thin deep-fried tofu) or atsuage (thick deep-fried tofu), since agedashi is coated with flour and meant to be eaten right away. It's a very delicate dish, so be sure you are ready to serve this immediately. The key to deep frying tofu is to press it a bit so that excess water is drained out of it. To do this, wrap the tofu piece in a cloth or in a couple of layers of paper towel, place on a cutting board, and place another cutting board on top. Put a cup of water or some other small weight on top of of the covering cutting board and leave to drain for about 30 minutes. In the meantime, make a simple sauce of 4 parts dashi stock to 1 part plain soy sauce, and keep warm. If you have a bottle of mentsuyu (concentrated noodle soup base) or you've made my Japanese essence, you can use this also, diluted with hot water at a 5:1 or so ratio. Grate some daikon radish to put on top. Unwrap and wipe the tofu, and coat in white flour, Fry in fresh peanut oil until a light golden brown on all sides. Drain well, put a couple of pieces into a small bowl, put plenty of grated daikon radish on top, and pour the dashi sauce over. Eat while piping hot. Submitted by maki on 2006-03-28 17:23. For the cold tofu, you do not need to cook it at all? Just drain and dry then serve? There's no risk of food-borne illness from eating it like this, right? Thanks for posting this. I really love hiyayakko! I have only had it a few times in really nice restaurants, since I don't make my own tofu, and I didn't know what it was called. It is so delicious, it's really a treat for me. My other favorite cold Japanese food is cold spinach in a faintly sweet soy sauce - I believe it was called ohitashi. Do you have a recipe for this? I have found some recipes online but none of them seem to have any sweet in the sauce, and that is how I remember it, with a little sweetness. Thank you for posting this! I grew up in Japan and agedashi dofu was one of my (and my family's) favorite dishes. I made it tonight for them for the first time after making tofu from your tofu recipe (for the first time) and it took all of us back. Thank you! I think the dish you may be thinking of is spinach gomaae: spinach in a sweet sesame sauce. I love hiyayakko too! Another way I like to eat fresh tofu is cubed and heated up in a light sugar syrup. It's a Chinese desert called "tau fu fa." This might sound obvious for you but I've been thinking about it for a long time everytime I cook or order Agedashidofu. Can you drink the dashi stock or it is only meant to give some flavour to the tofu? I never drink it 'cause I don't know if it is seen as something rude or unpolite. Well, in most cases the sauce or 'tare' is not drunk afterwards - it's considered to be a bit too salty for that, plus the excess oil from the agedashidofu washes off into it too. Of course if you're eating at home, who's to stop you? ^_^ The same goes for the tentsuyu that is used as dipping sauce for tempura; the sauce with the grated daikon radish is supposed to wash off some of the excess oil as well as flavoring the food itself. thank you so much!i saw an agedashi tofu recipe on youtube that i liked a lot, but i was worried about the sauce because at the moment i have no mirin or sake so i didn't think that the sauce would work. this recipe doesn't require the alcohol so that's great! My mom makes a really yummy cold tofu dish that this reminded me of. That's it! If you want to drink the sauce after you've eaten the tofu you shouldn't drain it, it tastes nice and the amount of oil we use is really little so it's not that big a deal. Hi! so this might be a really silly question, but what kind of tofu would you use to make agedashi tofu? silky, soft, firm? Agedashi Dofu actually tastes much better if you use corn starch in the dashi since it thickens the dashi and is more of the traditional style of Agedashi Dofu. There are always different variations depending on a persons taste but yes corn starch is used in more traditional recepies.